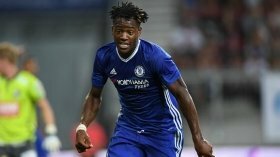 Chelsea manager Maurizio Sarri is unlikely to take the option to recall Michy Batshuayi from Valencia during the current transfer window. The Belgian was deemed surplus to requirements at the start of the season and this saw him being loaned out to the Spanish club for the campaign. However, his time at the Mestalla has been far from successful with just four goals across all competitions, but it appears that the Blues have no desire to terminate his loan contract. According to Goal.com, Sarri does not have any plans of recalling the Belgian from his temporary stint with Los Che despite the striker struggling to find his feet. It is added that Tammy Abraham could likewise stay put with Aston Villa for the rest of the season, though there has been widespread interest from top-flight clubs. Unlike Batshuayi, Abraham has excelled with the drop to the Championship and he is currently the joint-highest scorer in the division with 16 goals for the Villains.